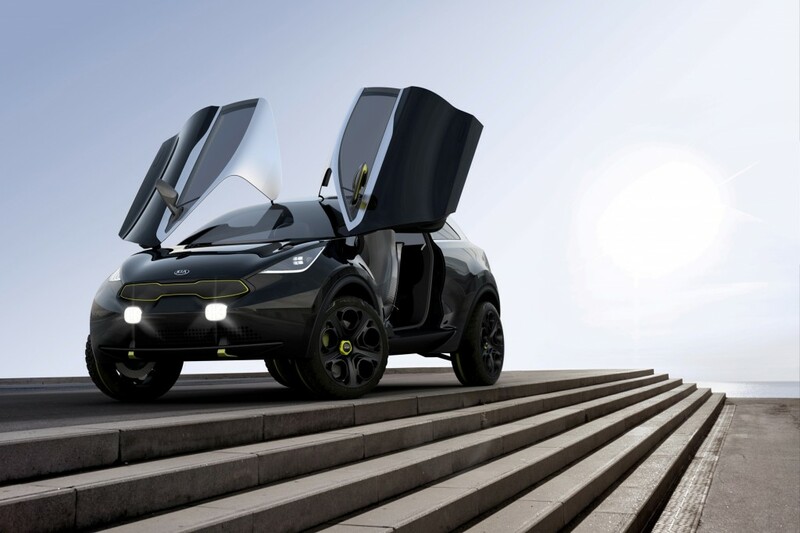 CHICAGO, Feb. 6 (Korea Bizwire) – Kia’s dramatic and modern Niro urban lifestyle concept vehicle, which was unveiled last September at the Frankfurt Motor Show, today made its U.S. debut at the 2014 Chicago Auto Show. The Niro hints at a possible future B-segment contender ready to take on the city environment with style and fun-to-drive attitude, featuring a mix of contrasting materials and compact, purposeful dimensions. The rally raid-like Niro also expands on Kia’s alternative propulsion story with its hybrid electric powertrain working through an advanced four-wheel drive system. Modern and Powerful Physique Although Niro presents a sturdy and muscular outline, it has relatively compact dimensions on its all-new B-segment platform. The design team started with the intention of creating a strong and purposeful outline with a startling two-tone exterior look. Its 164.8-inch overall length, 72.8-inch width and 61.3-inch height place it firmly in the city car bracket. The menacingly dark “Nightfall” exterior paint is sharply offset by a brushed, stainless-steel roof enveloping the entire cabin. This two-finish construction gives a unique and high-tech edge to Niro’s outward appearance. Also adding a feel that the car is virtually bursting out of its skin are running-board-type “blades” above the lower side-sills – echoed by similar creases in the front and rear lower valances. Furthermore, the concept’s firmly planted stance is defined by a 102-inch wheelbase and a 64.2-inch track. Kia’s signature grille’s outline, front and rear tow hooks, hood-mounted air outlet, and other exterior elements are highlighted in anodized “Limelight” aluminum and lend to the Niro’s impressive road presence. The front valance also features an asymmetric arrangement of air vents that were first seen on the Provo concept in Geneva last year. The aggressive-looking front fascia is enhanced by an ice-cube headlight arrangement, strip-styled daytime running lights around the outside edge of the headlight housing, as well as built-in quartered spot lights. Entry into the vehicle is by way of dihedral “butterfly” doors with flush door handles, that swing up high into the roof. Mounted directly onto the side windows are milled “Plexiglas® ” door mirrors with built-in cameras. And at the rear, the large hatch opens to reveal an expansive carbon-fiber-clad cargo deck ready to swallow large quantities of equipment, gadgets, gear or luggage. Part of the rear light cluster swings up as an essential element of the hatch architecture to give good light and visibility into the cargo space, leaving behind the secondary section of the cluster to enhance safety by ensuring others on the road can still see the car in the dark. The Niro’s powerful physique sits atop large 225/40R-20 tires mounted on milled-aluminum 20-inch five-spoke wheels. Edgy Interior The Niro continues its futuristic and tech-savvy theme within its 2+2 interior. Easy entry and exit are ensured by the butterfly doors which reveal a voluminous cabin defined by luxury touches and high-quality materials. Niro’s molded one-piece front seats are covered in an “Orbit Silver” line-quilted fabric. The clam-shell seatbacks tilt forward to allow access to a two-seat 50/50 split bench seat. These rear seats allow Niro to accommodate two extra passengers, but when folded flat they form the front edge of a useful, full-length carbon fiber load area. Extensive use of “Volcano Black” leather on the front dashboard coupled with switchgear finished in either anodized black or “Limelight” aluminum give the interior an upscale and sophisticated feel. For the driver, a perfect seating position is found thanks to the fully adjustable pedals and the deep-dished aluminum and leather steering wheel. Ahead is a Supervision digital instrument cluster. Additional information – such as altitude, Bluetooth®2 functions and satellite navigation — is displayed on a center console-mounted screen. This screen also allows the driver to see and record live pictures from video cameras mounted at the front, rear, sides and within the vehicle. Rising up between the transmission tunnel and the main dashboard structure are two anodized aluminum columns. The left column houses the engine Start-Stop button as well as the main transmission drive control. The right column has additional touch-sensitive panels which allow control of the in-car entertainment and computer functions displayed on the center screen. Advanced Propulsion Niro may be a designers’ eye view of a future B-segment contender, but that doesn’t mean it is a pure flight of fancy. This concept comes with a variant of Kia’s turbocharged 1.6-liter ‘Gamma’ engine, capable of 160 smile-inducing horsepower. The engine and a seven-speed, dual-clutch transmission serve the front wheels while an electric hybrid system powered by regenerative braking delivers up to 45 horsepower to the rear wheels – when road conditions require extra grip.